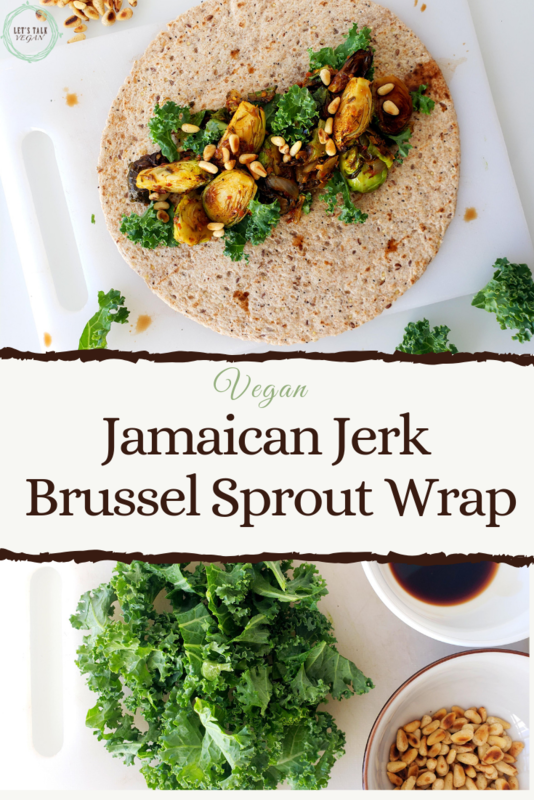 Crispy charred Brussel sprouts tossed in Jamaican jerk, layered on a wrap with kale, pine nuts, & balsamic. Make this easy recipe in 30 mins for lunch or dinner. I have been making quite a few recipes with Brussel sprouts lately, but they are just so darn good. I can't seem to get enough of them! The kale and Brussel sprouts balance the spicy of the Jamaican jerk sauce so nicely, almost even better than the smoked tofu. Plus, this recipe is minimal effort goals! Next, cut the stems off the bottom of the Brussel sprouts, then cut them in half or into quarters if they're larger. Place them onto a baking sheet and drizzle with olive oil. Toss to coat, then mix in the roughly chopped garlic and onion. Cook for about 15-20 minutes or until slightly charred. 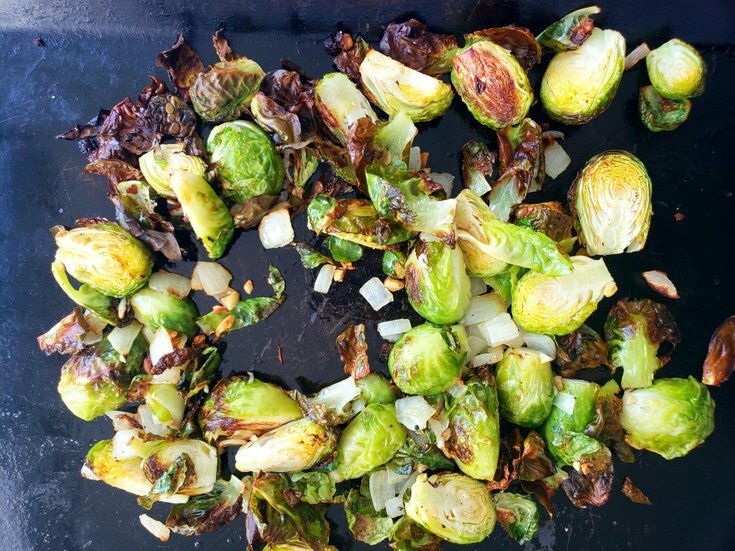 When you cook the Brussel sprouts on such high heat, it gives them a crispy charred outside while still maintaining a tender inside. Like I said before, this recipe is minimal effort goals. We are almost done already! 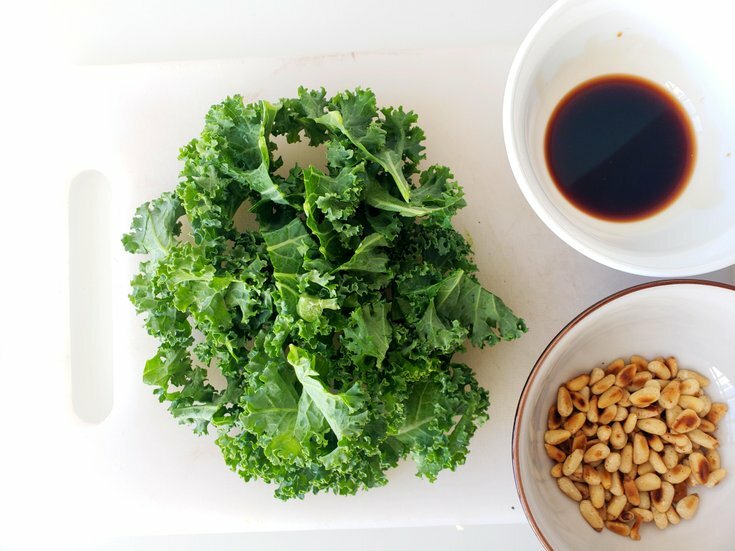 To prepare the kale, cut along the stem and leaf of the kale to remove the rib. Do this for both stalks, then discard the ribs. Next, roll up the kale leaves, then slice them into small bite-sized chunks. Set aside. If you are toasting the pine nuts, add them to a dry frying pan and cook over medium-high heat for 3 minutes or until golden brown. Make sure to shake the pan frequently while cooking to prevent burning. Once the Brussel sprouts are cooked, toss them in the Jamaican jerk sauce. Time to wrap everything up! 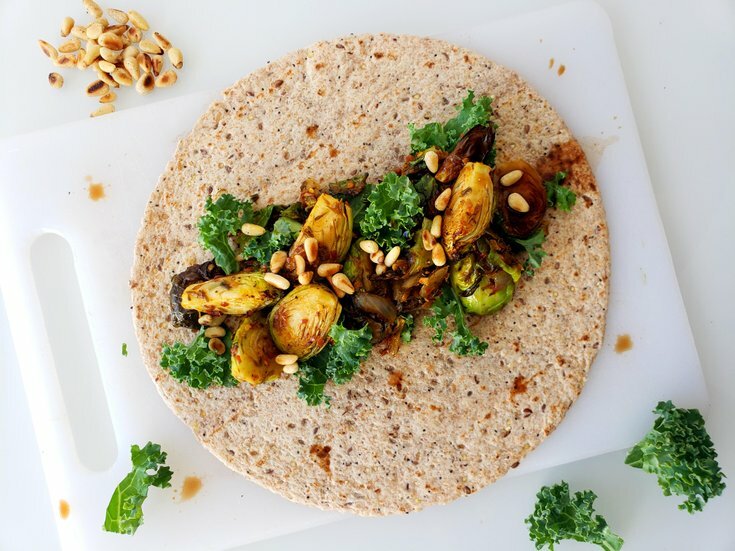 Divide the charred Brussel sprouts among the wraps, followed by the kale, balsamic, and toasted pine nuts. Fold the wrap up and enjoy! Cut stems off bottom of Brussel sprouts, then cut them in half or quarters if larger. Place onto baking sheet, drizzle with olive oil, roughly chopped garlic, and chopped onion. Toss to coat. Cook for 15-20 minutes or until slightly charred. Once the Brussel sprouts are cooked, toss in the Jamaican jerk sauce. 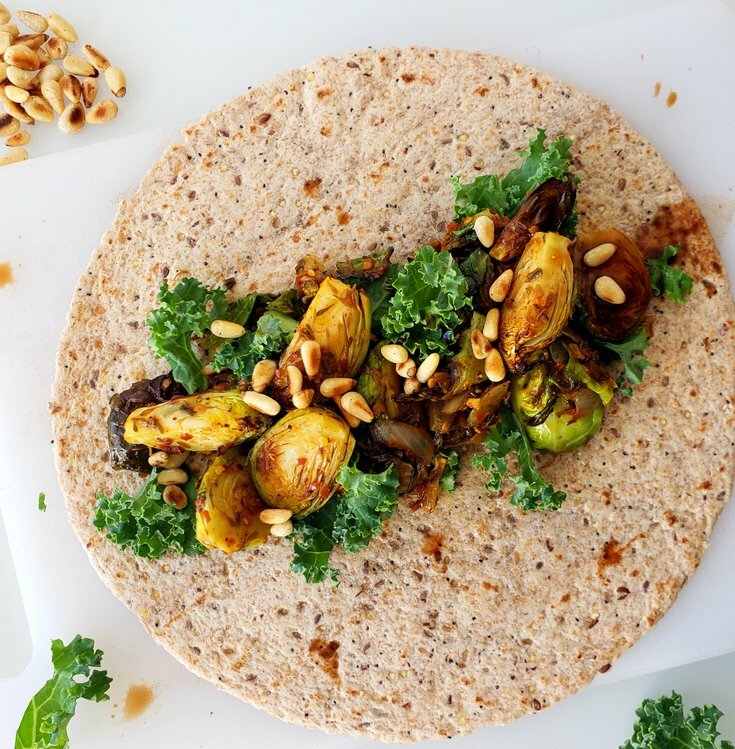 Divide the charred Brussel sprouts among the wraps, followed by the kale, balsamic, and toasted pine nuts. Fold the wraps up and enjoy! If toasting the pine nuts, add them to a dry frying pan & cook over medium-high heat for 3 minutes or until golden brown, stir constantly.